What does first-phase Brexit deal mean for NI? The UK government's guarantees on the Irish border seem to sharply limit the variety of Brexit that's now on offer. It has pledged that, even if there's no deal, the UK, as a whole, will fully align with the rules of single market and customs union which are necessary to support north-south cooperation. The debates on "full alignment" are already under way and there are also big differences of opinion on what rules actually support that cross-border cooperation. But, at a minimum, it would seem that the UK would have to continue to follow EU rules on trade in goods and agriculture. Former Brexit minister and Leave campaigner David Jones zoomed in on this possibility. He told the BBC Radio 4's World at One: "What we have got is just a commitment to try to work towards agreed solutions and if there are no agreed solutions then the clause provides that the UK will maintain full alignment with the rules of the internal market which support north-south cooperation. "The worry about that is, of course, that it could relate to very important areas such as, for example, agriculture which we would want to throw into the mix in negotiating a free trade agreement with a third country. "And if this was to persist, it could severely handicap our ability to enter into those free trade agreements, so I think we do need to see that particular provision refined." 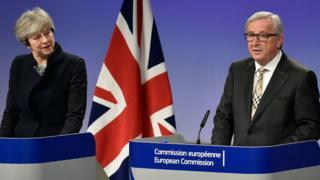 The EU's chief negotiator, Michel Barnier, was somewhat ambiguous in his comment. "It's a unique situation, therefore specific solutions are needed," he said. "That's a very clear line. And the UK's line is very clear too. We shall work on solutions which will be relevant only to the island of Ireland and not other parts (of the United Kingdom)." But if the fallback "no deal" position is UK-wide alignment, then doesn't it mean that the preferred option of a deep and special partnership would be something close to the Swiss or Norway option? That sort of deal is not currently compatible with the UK's red lines. Image caption The EU's chief Brexit negotiator Michel Barnier says that the present UK position would mean a trade deal would have to be along the lines as the one the EU has with Canada. There is going to be a lot of hard negotiating to come and compromises to be made. There is another interpretation of the deal that it still leaves the door open for a special status for Northern Ireland. TUV leader Jim Allister notes that the pledge of "unfettered access" for NI business to the whole of the UK internal market is not reciprocated with a promise of equal, unfettered access from GB to NI. Image caption Friday's Brexit deal allows talks to move to second stage. Could that mean that Northern Ireland would have some sort of different relationship with the single market while having preferential access to the GB market? The DUP leadership would say no, pointing to the assurances they have received from the prime minister. Sir Nick Macpherson, the former permanent secretary to the Treasury, gave a neat summary of the deal in a tweet this morning.